Microsoft’s Media Player Redirection is great technology that allows a near native user experience when playing videos trough RDP. But sometimes it can be hard to tell if it is working (not be confused with if it is ‘enabled’). This Microsoft tip helps you determine if it is working. Especially in RDP8 the server side rendering of video is so good that it is pretty hard to see if WMR is actually used. In RDP7 it was a lot easier to see because the video performance would be so bad without WMR that it was easy to tell. In RDP8 the way to tell is actually pretty easy. If you are running a full desktop and you want to check if WMR is working (even if you think you turned it one) you should the live preview tiles. So on your remote session, launch a video in Windows Media Player and minimize it. 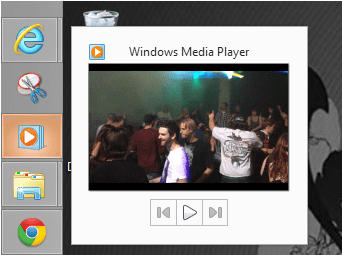 Then, highlight Media Player in the task bar to show the ‘live preview’. If it actually does show a mini preview of the video you are playing then WMR is NOT working. This is because when WMR is being used, the video is actually redirected to the client and not rendered on the server and as Windows does not know what to display in the live preview. Great tip huh? Thanks again for Microsoft for providing it!